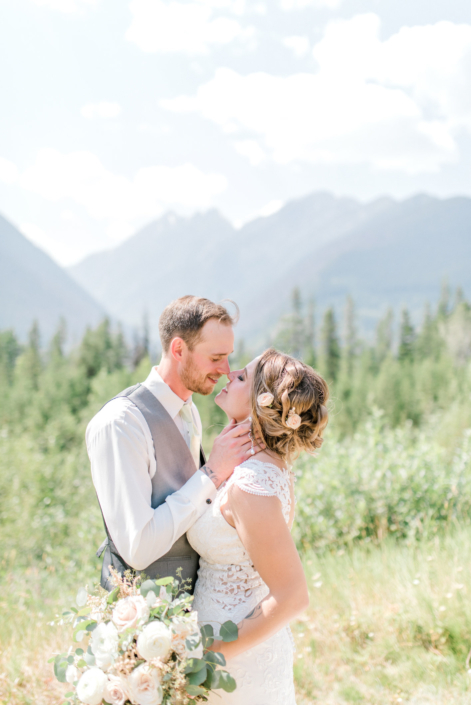 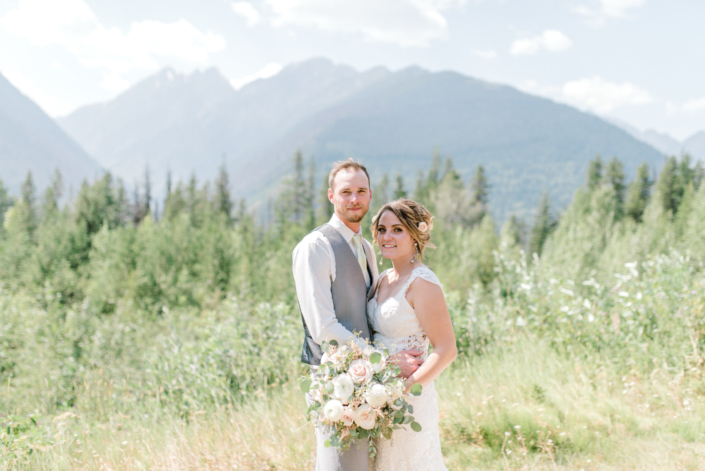 Today I am excited to share with you Ashley and Peter’s Revelstoke Wedding! 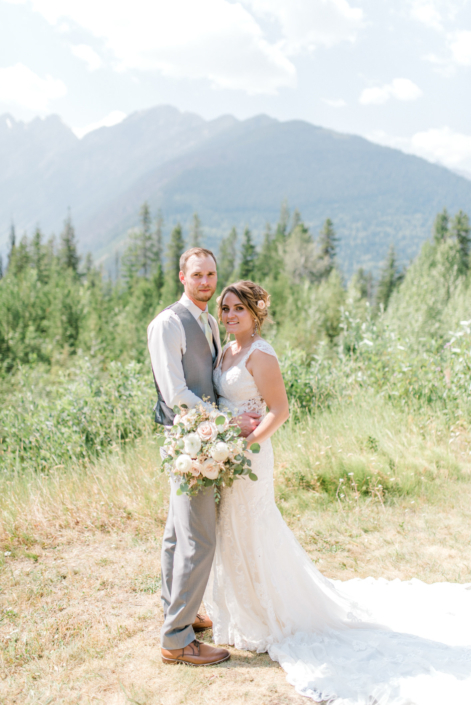 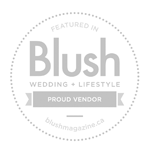 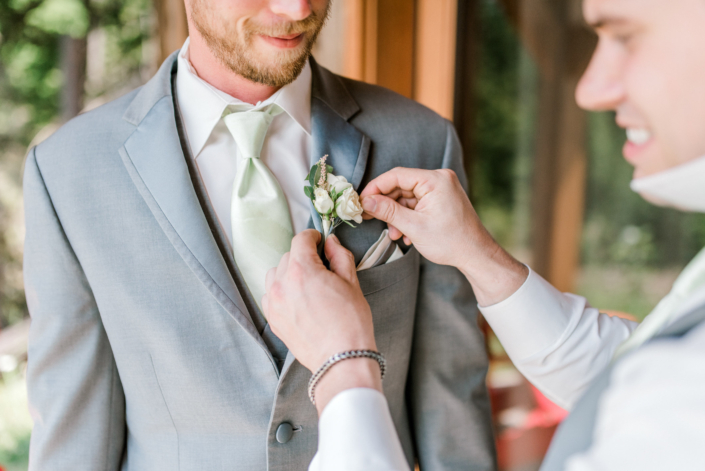 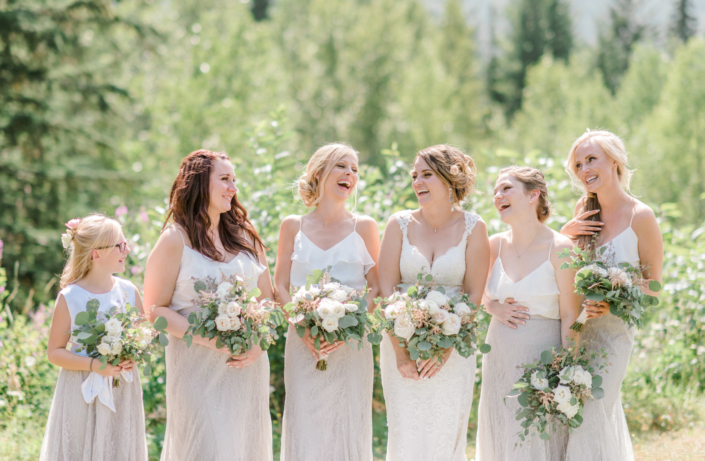 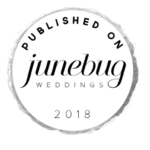 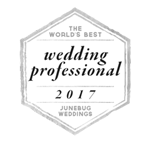 This rustic blush wedding was held at the Heather Mountain Lodge near Revelstoke, British Columbia. 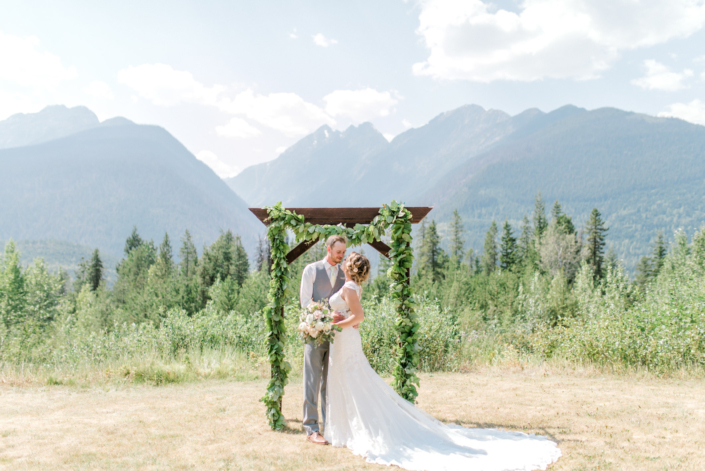 Although a bit smokey, it was a beautiful day for this outdoor ceremony! 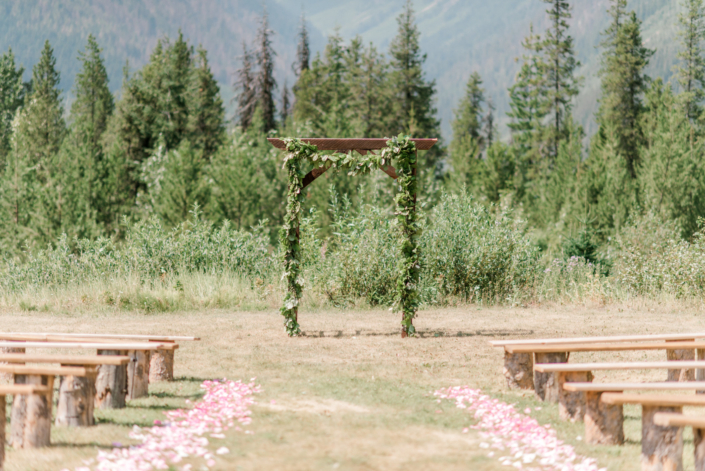 Rose petals lined the aisle to a simple wooden archway draped with a fresh greenery garland. 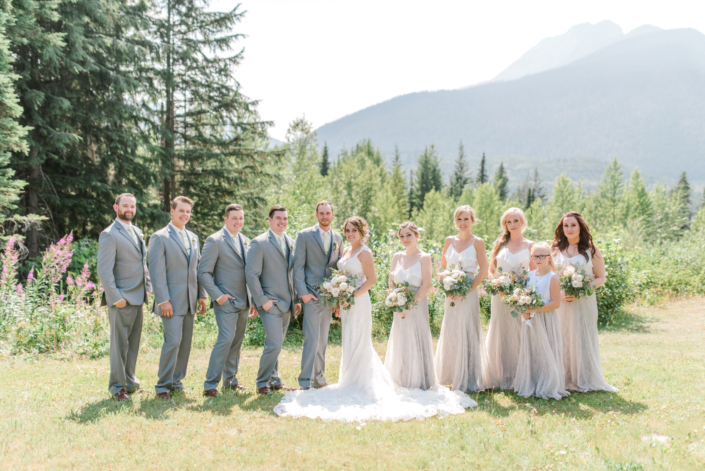 Its rustic simplicity is the perfect way to create a focal point at the end of the aisle while not drawing attention from the bride and groom. 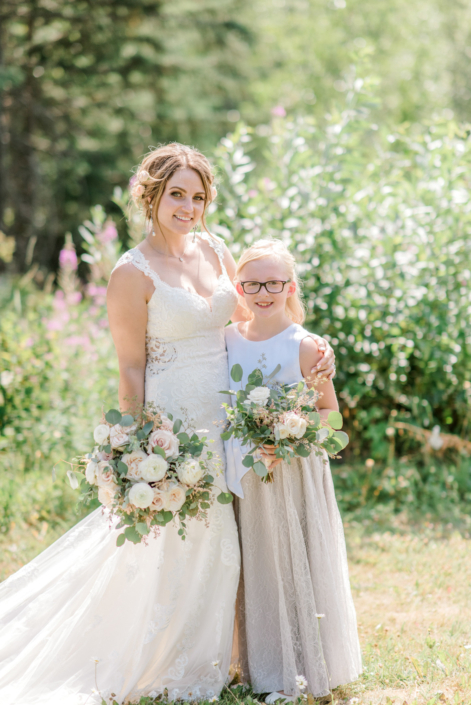 Speaking of which, Ashley was one beautiful bride! 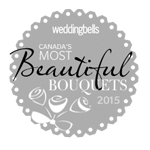 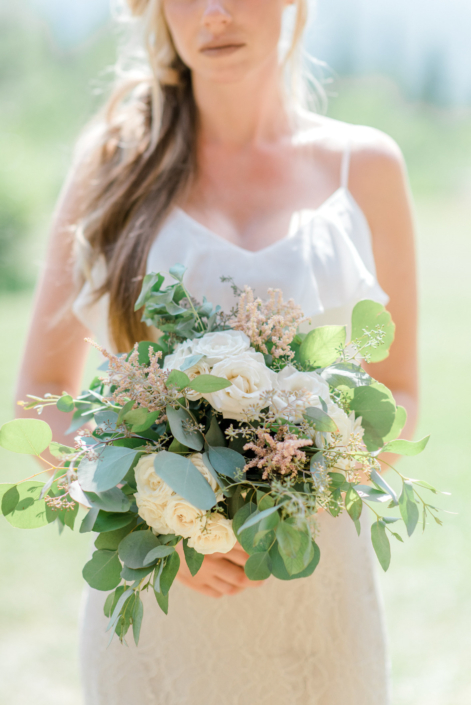 She had spray roses tucked into her hair and carried a stunning natural hand-tied bouquet. 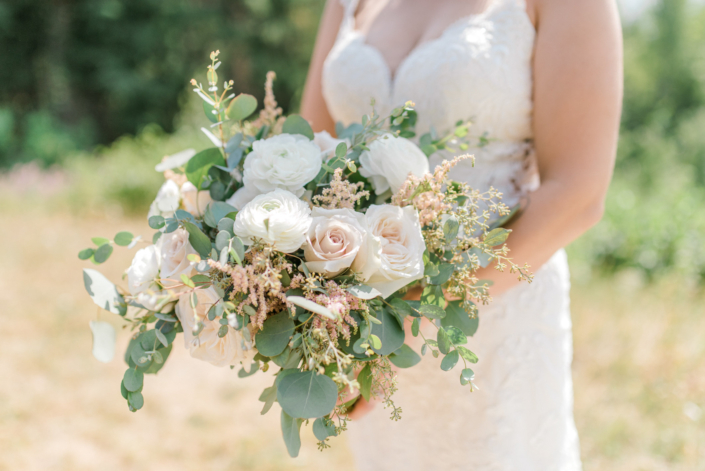 It was made of white ranunculus, quicksand roses, white o’hara garden roses, pale pink astilbe and a mixed variety of eucalyptus. 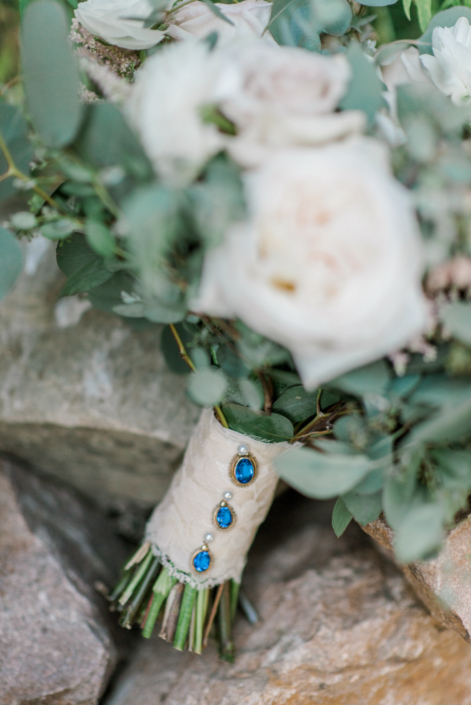 For a little something blue, sapphire gems were added on the lace wrapped handle. 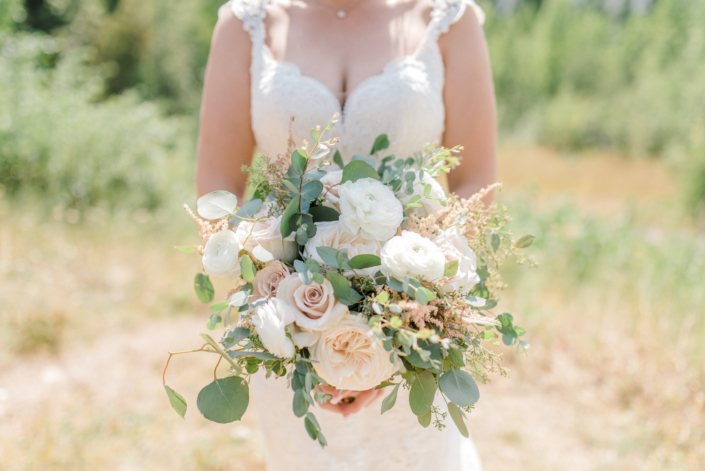 A perfect rustic blush bridal bouquet! 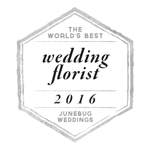 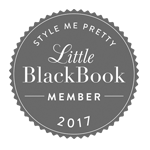 Peter and his groomsmen wore “mini bouquet” styled boutonnieres that were designed with astilbe, spray roses and eucalyptus. 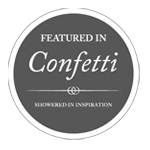 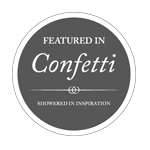 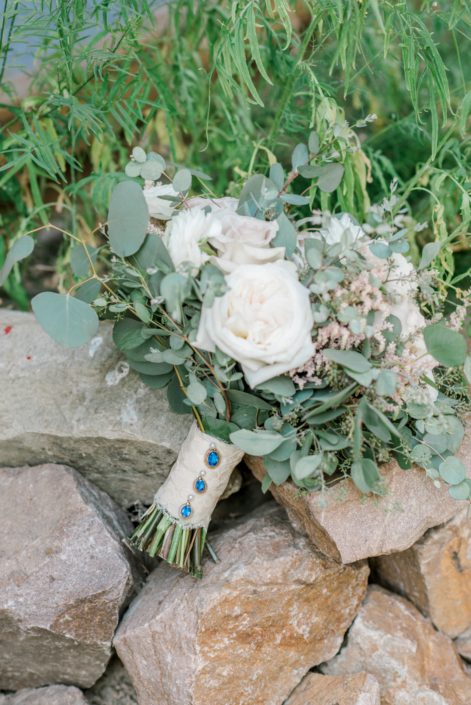 The perfect touch to accent the bride! 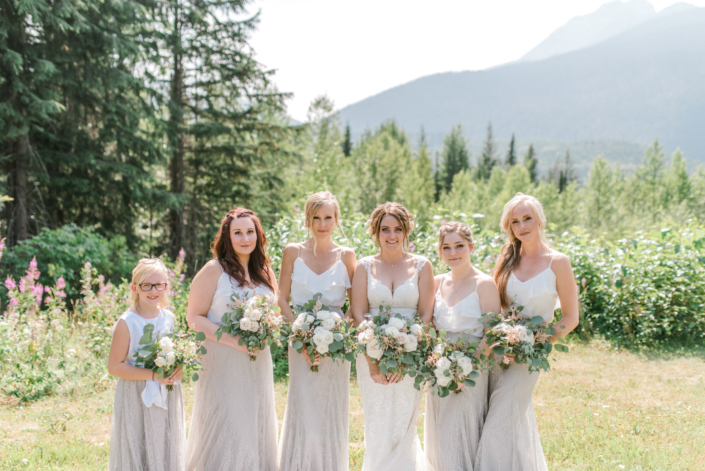 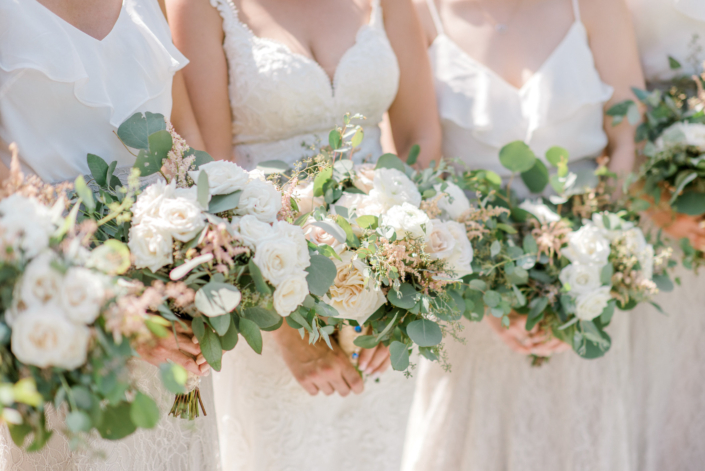 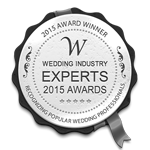 Her bridesmaids and junior bridesmaid carried smaller bouquets of ivory spray roses, pale pink astilbe and eucalyptus that complimented the bride’s bouquet perfectly. 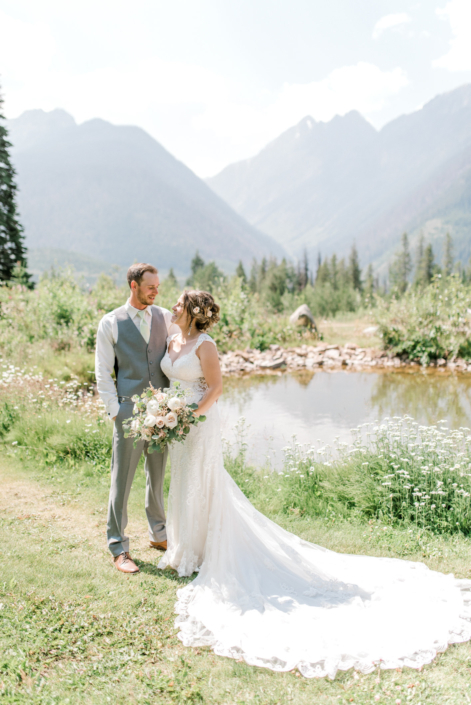 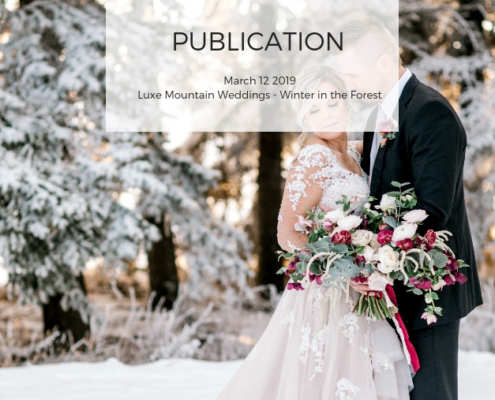 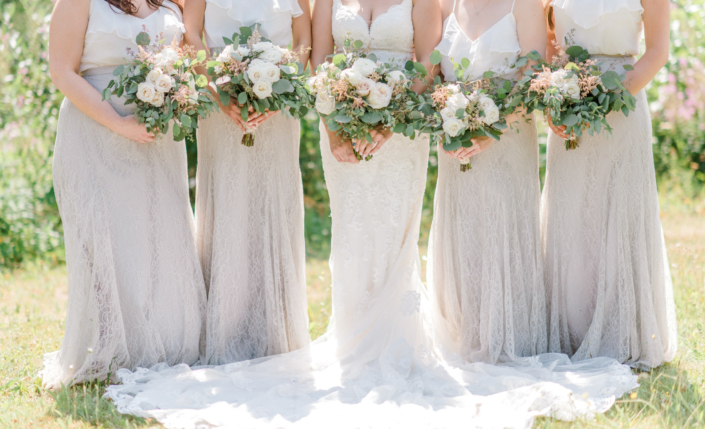 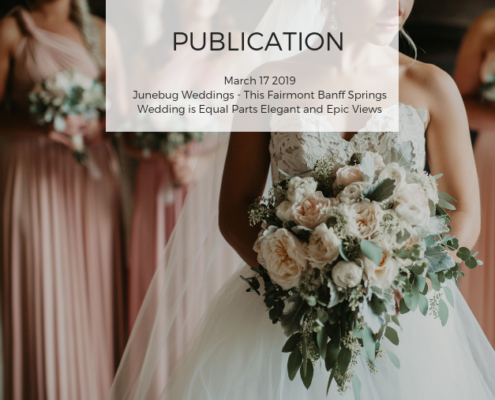 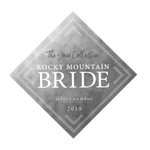 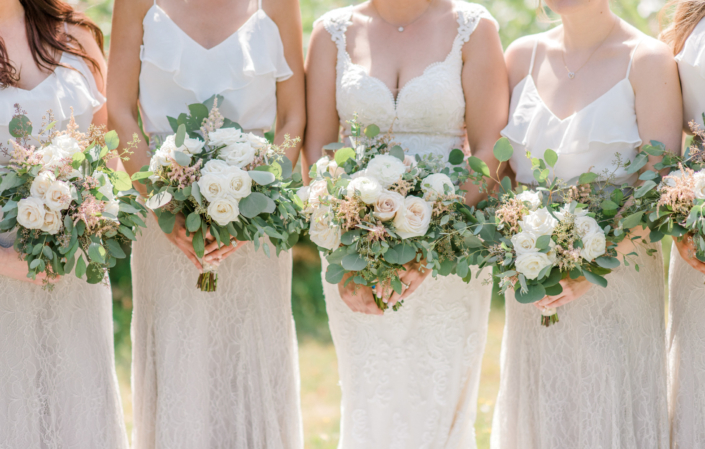 Please enjoy the photos from Chloe Buie Photography of this beautiful mountain wedding!